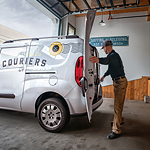 The ProMaster City comes with a robust powertrain that includes a 2.4L Tigershark Multiair 2 engine that is paired with a class-exclusive nine-speed automatic transmission. The engine offers best-in-class torque, horsepower, and highway driving range. It can reach 178 horsepower and 174 lb.-ft. of torque and gets a highway driving range of 448 miles. In addition, the engine is also equipped with a three-piece air filer and pulse-width-modulated fuel pump for increased efficiency. The van also provides you with a best-in-class payload so that you can easily transport heavy equipment. Its maximum payload is 1,885 pounds, and its maximum roof load weight is 150 pounds.